The women vote for a new top dog. Joyce's life is under threat. May and Willie embark on the robbery. Rita is inducted by Joan: she is on remand for GBH. Backed up by Meg, Joan demands that Rita removes her leather jacket because of the chains on the sleeve. Joan shortcuts the procedure by ripping the chains off . The other new prisoner is Barbie Cox, and Joan and Meg are both surprised by Barbie's charge (and we never find out what it is), though any criminal charge is implausible as she seems to be the dimmest of dumb blondes. Reb looks forward to her release and what to do with her compensation money. Joan warns Rita not to cause trouble, and is startled when Rita grabs her by the lapels and almost lifts her off the floor. Reb loses her temper with Nora, Julie and Joyce, proving Julie's point that the more she asserts herself, the more she will revert to her old character. 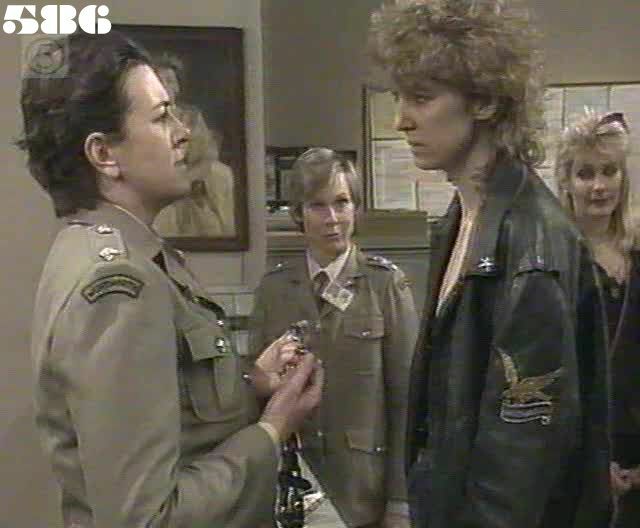 Eve is the first prisoner to meet Rita: as she passes her cell, Rita is making nostalgic motorbike noises. Eve backs away when Rita seems to be making a move on her, but Rita tells her not to worry as she's only into blokes: she says she's inside for beating up another woman who slept with her bloke Slasher. Rita gets permission to work in the laundry and meets the other women. David comes to visit Eve and he has told her that he has disposed of the evidence against her. Joyce gets suspicious and presses her ear to the door. Eve sees the door handle move and realises Joyce has been listening at the door of the interview room. Rita entertains the women with her anecdotes : Nora is obviously very favourably impressed. Eve waits for Joyce to come back after escorting David to reception, and establishes that Joyce did hear their conversation but has not yet reported it to the Governor. As Joyce turns to leave, Eve pushes her against the far wall then behind the interview room door and bashes Joyce unconscious by repeatedly slamming the door into her face . She takes Joyce's keys and drags her body to along the corridors. She has to hide out of the way as Joan encounters Barbie wandering through the corridors and reprimands her for talking back: "Naughty, naughty, MISS FERGUSON!". After locking a security gate begind her, she drags Joyce's body into Reb's cell, and when Joyce appears to be coming round, she finishes the job with a kettle. After cleaning her fingerprints off the kettle, Eve locks herself back in the interview room. Reb is on laundry pickup and finds Joyce: Meg comes into the cell behind her and assumes that it was Reb who was the attacker. Ann interviews Eve about what happened to Joyce, and she deliberately mentions hearing Reb's voice. Reb denies attacking Joyce or knowing where her keys are: she is taken to solitary. Ann orders a cell search to try to find the missing keys. Eve is locked in her cell by Joan who tells her there will be a cell search, but refuses to let her go the toilet, so Eve is unable to get rid of Joyce's keys. May and Willie meet the rest of the gang to go over the plan: it does not look as though things will go smoothly. Ann reprimands Joan for tearing Daphne's plants to pieces during the search. Pat omits to body search Eve because she thinks she can't have the keys, since she was locked in the interview room. Meg has doubts that Reb is guilty and is inclined to believe her claim that she found Joyce. Rita comforts Daphne when she is upset at her plants being wrecked in the cell search. The women assume that Reb was guilty of the attack on Joyce and blame Nora and Julie for helping Reb. Willie is very apprehensive about the robbery and is convinced something will go wrong. Lou tells Nora that after she left the rec room the women elected her as the new top dog. The women have to wait for breakfast as Mervin is at hospital: Rita refuses to let Lou jump to the top of the queue. Lexie taunts Lou with the possibility that her reign as top dog will be short when Rita gets into her stride. Willie says goodbye to May as she sets off for the robbery. Lou and Alice try to rough up Rita but she takes them both on single-handed. I rate this (mainly the first half of it) among the classic Prisoner episodes: for the quality of writing, acting and direction, as well as a daring mix of suspense and comedy that for once really does work. And it even survives some minor implausibilities: would there really have been no sign in the interview room of Eve's attack on Joyce? No blood at all? When Eve mentions Pat Slattery's husband, Pat snaps back that she's divorced. This was the point at which Meridian dropped the series.